Bored with your apps, looking for something new? Check out these 26 iPhone and iPad apps that were just released. 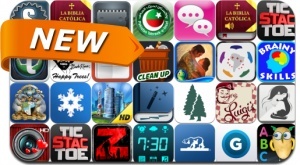 This new apps alert includes Survivor Z, Tic Stac Toe, CleanUpStreet, Event Book, Power Photo, Lirum Device Info, Pro 6 in 1 News Clock Radio Set, TumbleTrack, MyStranger, JuJoo, Event Book, Brainy Skills WH Game and many others.